Aussie Bee has received many emails and letters over the years from people keeping native Australian stingless bees. Often the stories are about thriving hives but sometimes there are sad tales about hives which have died. -- Keeping species outside of their natural geographic range. To help avoid the loss of stingless bee hives it is important to choose the correct species and hive designs. In the page below, we have grouped together hive sellers whose species and box designs, in our experience, best suit particular areas of Queensland and New South Wales. Our recommendations for other states are also given below. DISCLAIMER: The Australian Native Bee Research Centre does not receive commissions from any hive sellers for sales of stingless bees. The Australian Native Bee Research Centre has taken every care to provide accurate and current information in this webpage. However, the publisher or editor will not accept responsibility for injury, loss or damage occasioned to any person acting or refraining from acting as a result of the material in this webpage. Pick up from Zillmere. Courier service to most of east coast. Established splittable and honey pot hives, empty boxes and hive tools, Roof and stand options, books and posters, educational services, rescue and splitting services. Greg offers a guide for new hive owners and assists with hive installation and splitting in the local area. Also supplies OATH hive boxes. Customer to pick up hives. NNBees is a registered vendor to NSW Government schools and supplies hives and provides presentations to pre-schools, primary schools and high schools. Sells both Non-splitable and Splitable western red cedar hives (in boxes). 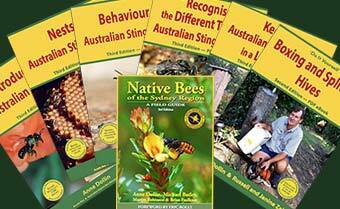 In addition a booklet "Getting Started with The Australian Native Stingless Bee" comes with your first hive. Hives are pick up hive from Nashua. Sells colonies in artistically carved logs with honey supers - functional art; can be made to order with your designs! Honey also for sale. Located in QLD but specialising in supplying hives for Sydney. Toby provides interactive native bee and pollination workshops to school groups of all ages as well as supplying hives (with 12 month guarantee). Also provides presentations to community groups, preschools, primary schools and high schools. Empty hives, flat packs and teacher resources also available. Crop pollination service provider and honey (sugarbag) producer. i.e. Central Coast, Sydney, eastern side of the Blue Mountains and South Coast. --- Log hives with thick walls are recommended for the NSW South Coast because they are better insulated than boxed hives. --- On the western fringe of Sydney and the eastern side of the Blue Mountains, special care needs to be taken in siting boxed hives. Placement in a shed or verandah is recommended. Log hives are more reliable. --- Keeping stingless bees is not recommended on the western side of the Blue Mountains and in more inland and southern areas of NSW because low winter temperatures can cause loss of hives. --- Honey harvesting is not recommended in cooler areas of NSW because the bees need their excess honey stores to survive the winter months. --- Hive splitting should be done less frequently cooler areas of NSW and it requires greater care to prevent loss of hives. Elke says that she supplies and installs native stingless bees in boxes suited to the Sydney climate: T. carbonaria bred and acclimatized in the Sydney region. She is located in Sydney. She also installs native hives into schools, community gardens and provides native bee talks, presentations and demonstrations. Sells Non-splitable honey hives (in boxes) to order. These hives are propagated using eduction and natural propagation methods. They are constructed in western red cedar for hotter and cooler areas. In addition a booklet "Getting Started with The Australian Native Stingless Bee" comes with your first hive. Pick up from Terry Hills. Courier service to most of east coast. Established splittable and honey pot hives, empty boxes and hive tools, Roof and stand options, books and posters, educational services, rescue and splitting services. Keeping stingless bees in the ACT is not recommended because it is outside of the natural geographic range of the stingless bees. Keeping stingless bees in Victoria is not recommended because it is outside of the natural geographic range of the stingless bees. Keeping stingless bees in Tasmania is not recommended because it is outside of the natural geographic range of the stingless bees. Keeping stingless bees in South Australia is not recommended because it is outside of the natural geographic range of the stingless bees. IS YOUR AREA NOT RECOMMENDED FOR STINGLESS BEES? Many other fascinating types of native bees may already be in your garden! Find out what native bees live in your area! You can support and encourage these bees by planting nectar rich plants in your garden. Stingless bees occur only from the Hamersley Ranges northwards in Western Australia. Western Australian authorities are strongly opposed to stingless bees being brought into more southern areas of Western Australia as they would disturb the unique balance of Western Australia's wildflowers and pollinators. Aussie Bee firmly supports the position of the Western Australian authorities in this issue and is keen to protect Western Australia's wonderful native bee species. All of the beekeepers whose details are listed on this page have agreed not to send hives of stingless bees into southern areas of Western Australia. Matthew Middleton has rescued some log nests of stingless bees from landclearing in the Kimberley. These nests are available for sale to local northern WA customers only. Colonies of Austroplebeia essingtoni in boxes, for customers in Broome WA and surrounding areas. A variety of Tetragonula hockingsi is found in northern areas of the Northern Territory but other Northern Territory species differ from those of the eastern states. Obtaining nests of stingless bees from local suppliers is recommended in the Northern Territory. Supplies stingless bees to his local area and the Top End surrounds. Also does bee rescues and can make custom bee boxes, solitary bee motels and log hives. If you wish to have your contact details added to these lists, please write to the ANBRC at the address below. Important: To have your contact details listed on this page as a hive seller, you must undertake not to send any stingless bees into southern areas of Western Australia.